Think San Antonio is just for strolling the River Walk and remembering the Alamo? Not anymore. One innovative neighborhood is helping to transform the 300-year-old city’s image—and paving the way for its revitalization. It’s an unusually hot Friday in early June in San Antonio, but even 100-degree weather isn’t stopping people from descending on the city’s most exciting neighborhood. Children shriek as they run across a splash pad, and parents keep a watchful eye from under the shade of blue umbrellas. In air-conditioned cafes, freelancers tap away on laptops while students from the Culinary Institute of America’s San Antonio campus stride to class in white chef’s jackets and clogs. There are restaurants everywhere in this neighborhood—17, to be exact, many of which are helmed by chefs who graduated from the CIA’s program here. At the moment, power lunchers are filling the restaurants. One of the most popular is Cured, where a meat locker dominates the middle of the dining room, demanding homage; Steve McHugh, the chef, has been nominated for the James Beard Award for Best Chef: Southwest three times since Cured opened in 2013. 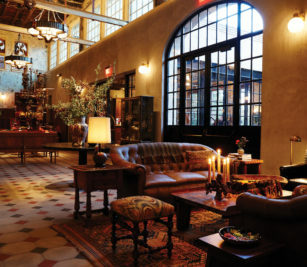 At the heart of this community is the magnificent Hotel Emma, whose lobby is filled with guests sipping margaritas from hand-etched blue glasses and tourists taking a peek at the Roman and Williams-designed property, which is housed in a 19th-century brewery, the longtime maker of Texas icon Pearl beer. 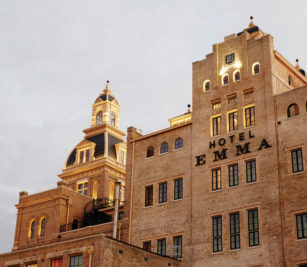 Hotel Emma, which opened in 2015, is not just one of the finest new hotels in the region, it’s one of the finest hotels in the country, period. You can see its perfectionism in details such as custom guayabera-style robes in the rooms, minibars stocked with Texas favorites like Topo Chico water and service that is wonderfully anticipatory while never obnoxious: Go for breakfast two mornings in a row at restaurant Supper, and the waiters will remember your coffee order from the first day. All of this constitutes Pearl, a 22-acre development north of downtown that’s home to some of San Antonio’s most coveted apartments, restaurants, shops, a weekly farmers market, event venues like the sonically state of the art Jazz, TX and the CIA’s 30,000-square-foot campus, its third in America. It’s hard to imagine that this site was a brewery as recently as 2001. But the San Antonio of 2001 wasn’t the San Antonio of today, and with year-over-year population growth that ranks among the highest in America, it’s not the way San Antonio, which now has a metro area population of about 2.5 million, will look in 2050. So how does a city that’s now celebrating the 300th anniversary of its founding stay true to the roots that make it one of America’s most culturally—and demographically—diverse cities while planning for growth? With the help of a forward-thinking local government, a supportive business community and visionary leaders, Pearl is leading the way. In 2002, a local billionaire named Christopher “Kit” Goldsbury, who made his fortune in 1994 when he sold Pace Foods (maker of Pace Picante sauce) to Campbell’s for $1.1 billion, bought the Pearl Brewery site through his private equity firm Silver Ventures. In business from 1883 to 2001—Pearl is now brewed in Fort Worth and distributed regionally—the brewery had been abandoned. Goldsbury saw the potential to create a culinary and cultural hub. At the same time, the city was embarking on a $72 million expansion of the San Antonio River called the Museum Reach project. Though San Antonio is known for its River Walk—the downtown district where the banks of the river are lined with hotels, restaurants, bars and shops popular with vacationing families and convention attendees—the riverbanks north and south of the core district weren’t navigable by boat. In some places, water levels were so low that the river looked more like a creek. “There was a general feeling within the city that it was time to re-look at the river and what it could be,” says Suzanne Scott, general manager of the San Antonio River Authority. 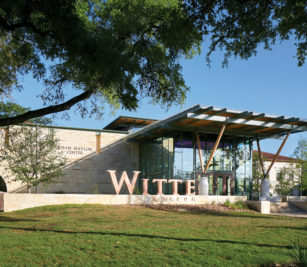 The Museum Reach project was so named because this 1.3-mile stretch of the river runs past the San Antonio Museum of Art, the natural history Witte Museum and the DoSeum, a museum for children. That same stretch also ran by the Pearl Brewery site. “Kit Goldsbury knew the Museum Reach project was going to be a catalyst for making his Pearl development a destination because the connection to the river was going to be important,” Scott says. One of the best ways to understand the city’s evolution is to visit the current “Confluence and Culture: 300 Years of San Antonio History” exhibit at the Witte Museum, which walks museumgoers through the city’s founding by the Spanish in 1718, the building of its five Spanish Colonial missions, its development as a military hub that was the site of the famed Battle of the Alamo and its emergence as a modern city. A culinary education center opened in 2006. Two years later, Kit Goldsbury donated $35 million to found the CIA campus in that center. Most of that gift is earmarked for scholarships for local Latino students, a recognition of the city’s demographic and culinary heritage. Residential and retail developments followed, as did Hotel Emma. Goldsbury, 75, almost never gives interviews and didn’t for this story. But those who know him say that in investing in an undistinguished parcel of land surrounded by warehouses and highways, he was motivated by a love for San Antonio as much as a quest for profit. When you look at the spare-no-expense transformation of the Pearl Brewery, it’s clear that a typical bottom line-driven private equity firm would never have made the same choices. Elsewhere in San Antonio, that vision seems to be contagious. Silver Ventures is developing another site south of downtown near the 1968 World’s Fair site, and the city has developed another 8-mile-long stretch along the river called Mission Reach, which helped the area’s five historic Spanish missions sites and a nearby ranch win designation as a UNESCO World Heritage Site in 2015. Developer Graham Weston, who cofounded cloud-computing company Rackspace, has been instrumental in bringing businesses back to downtown by developing coworking and office spaces. Through a public-private partnership with the city and Frost Bank, his Weston Urban development company is building the city’s first new skyscraper in decades: the $142 million Frost Bank Tower, slated to open in early 2019.